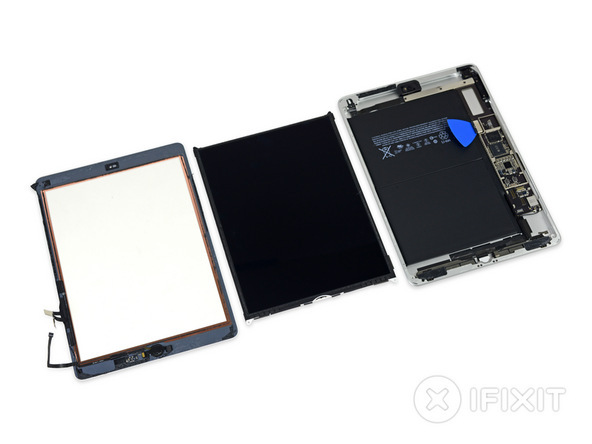 iFixit has shared a brief teardown of Apple's new 9.7-inch iPad unveiled last week, and unsurprisingly, the tablet looks just as much like an original iPad Air on the inside as it does on the outside. 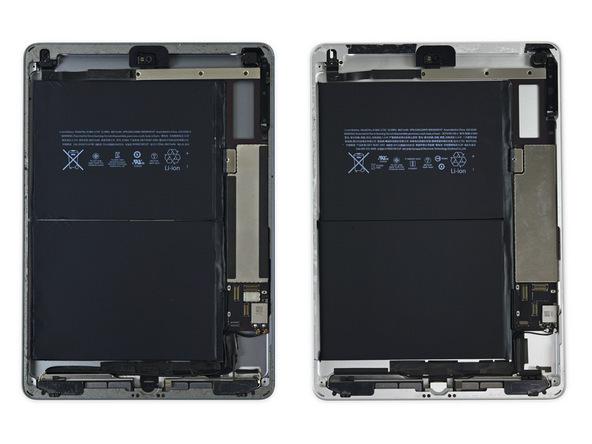 In the side-by-side photo above, iFixit noted the original iPad Air on the left has a slightly larger Wi-Fi module compared to the new 9.7-inch iPad on the right, but otherwise the tablets look virtually identical. iFixit said the new 9.7-inch iPad remains difficult to repair due to the front panel being glued to the device and strong adhesive holding everything in place. One plus is that the battery is not soldered to the logic board. The new 9.7-inch iPad is all about price. It's the cheapest new tablet that Apple has ever sold, starting at $329, yet with a brighter display and a faster A9 processor compared to the now-discontinued iPad Air 2. The fifth-generation iPad, as it is officially known, is also somewhat thicker and heavier than the iPad Air 2 since it lacks a fully laminated display with anti-reflective coating in order to keep costs down. The tablet's tech specs are otherwise identical to the iPad Air 2, including a display resolution of 2,048‑by‑1,536 at 264 PPI, 8-megapixel rear iSight camera, 1.2-megapixel front FaceTime camera, two speakers, Lightning connector, 3.5mm headphone jack, Touch ID with Apple Pay, and Bluetooth 4.2. The new 9.7-inch iPad can be ordered now on Apple's website in the United States and dozens of other countries. Apple said the new 9.7-inch iPad is also available to purchase at select Apple Stores, authorized resellers, and carrier stores starting this week in more than 20 countries, including the U.S., Australia, Canada, China, France, Germany, Italy, Japan, Netherlands, Spain, Sweden, Switzerland, and the U.K. In other words, after 2 years they've been able to make 1 laptop and re-release their iPhone and iPad. Yeah, big plans.. can't wait for that TV and Car they're working on..
To be perfectly honest, even when i try out the "new" iPhones, they are basically the same as the old iphones. Apple is just all about coming up with new color products now. Yep, it's turned into a fashion company now. Pro users? WHAT? .. no cli for you! who needs a file system.. get out! Didn’t Steve say that Apple was in the business of making the best possible products, not in the business of racing to the bottom? The reaction to this device is, like the devices themselves, very similar to the reactions to the iPhone SE over the 5/5S/6S which that was a hybrid of. Positive from people who value the low price option, negative from people who don't get that and seemingly only ever want ever-more powerful and expensive devices than anything released before. I think it's great that Apple are bringing back proven hardware in a new combination at a lower price. I would love a Mac Pro SE that took this approach - up to date specs in the old 5,1 form factor for a budget price... yes please. And not to get into political stuff, but given the UK (where I am)'s political/economic situation, it's especially important if Apple wants to retain its level of sales here, because the price rises on existing products threatens to seriously damage Apple in the UK IMHO. Of course so does having ancient computers at those inflated prices too, but that's a whole other issue by itself. No complaints here. Upgraded CPU and lower price make this a perfect replacement for my dad's iPad 3. It looks so stupid but I like that they have finally sorted it out. Makes sense to have an iPad Mini line, an iPad line, and an iPad Pro line. Seriously the iPad isn't a priority for Apple and the lack of innovation shows it. You are all missing the point of the product, which is a low cost iPad to help curb sliding sales. It's not meant to be an "innovative" product. an old product disguised as new. COURAGEOUS!